Thank you Best Pacific Institute of Education! I am honoured and grateful to share a talanoa session that I had with the New Zealand born Tongan Coloratura Soprano, Christina Vehikite. She is an amazing young woman with a beautiful heart. She is currently studying for her Honours in Classical Voice Performance at the University of Waikato under the tutelage of Dame Malvina Major. Since the age of 10 years, Christina has accompanied Latter Day Saints congregations on piano and she has sung in church choirs. At the age of 15, she performed for the Prime Minister at that time, Helen Clark. In 2004, her classical training began and 5 years later, she was a soprano soloist in the University of Auckland Choir performing Haydn’s Nelson Mass. She is currently a member of the New Zealand (NZ) Chapman Tripp Opera Chorus. With experiences in teaching contemporary singing and piano at a South Auckland music school to students ranging in age from 5 years to 40 years, Christina’s passion for singing led her into the New Zealand Singing School based in Napier for 2013. In that same year, she played the character of Jane in the premiere of the opera The Auction by NZ Composer Janet Jennings. Furthermore, she played the 1st Lady in The Magic Flute Opera by Mozart. Christina was placed 2nd in the Aria completion at the Te Awamutu Competitions in September 2013, and she was placed 3rd in the Regional Prizes in two classes within the over 21 category at the New Zealand Aria Competitions in Rotorua in November 2013. More recently, Christina was chosen as one of six students in NZ to represent her University as a participant in the NZSS Masterclass with Dame Kiri Te Kanawa in June 2014. She played one of her first major lead roles as Mahina in the opera The White Lady by David Griffiths at the University of Waikato in August 2014. In addition, she is the recipient of the Wallace Corporation University of Waikato Blues Award for Excellence in Vocal Performance in October 2014. Furthermore, last week Christina was selected as 1 of 80 students last week into the NZ Singing School in Napier for 2015. Thank you Christina for taking the time to have this talanoa session with me. I am grateful for the opportunity to be able to share a part of your journey on the blog. Please tell us about your background. Thank you for the invitation to be featured on your blog. I appreciate this opportunity. I am the oldest of 3 girls. My parents are Moeaki and Seini Vehikite. 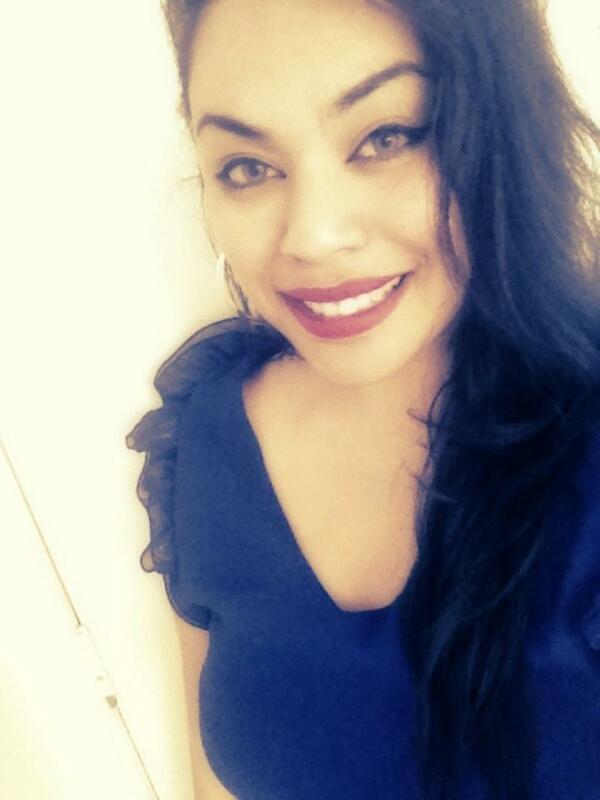 I was born here in New Zealand and I am of Tongan descent. My Mum and Dad were always my number one supporters and especially my sisters. They have all played a part of inspiring me each in their own way and I thank them from the bottom of my heart for that. Wherever I was, they were there. Music was a big foundation of my childhood growing up. I was always encouraged to perform everywhere – school shows, rest homes, festivals, political events, church talent nights and so forth. Today, I am a tertiary student at the University of Waikato majoring in Classical Voice performance under the tutelage of Dame Malvina Major – Honours year. Fantastic. Your parents must be so proud of you. How is your experience with tertiary study going? It has been quite enjoyable. So, in the honours programme, there are weekly lessons that are 1.5 hours with your teacher and also depending on your level of study you also get some time with your accompanist/vocal coach each week as well. Our voice classes are set like a master class so for Seniors Voice class – honours students – Masters Students would get up and perform and get critiqued afterwards. This helps us improve our pieces, whether it is comments on your singing technique, diction, articulation, language etc. The feedback is important as it helps immensely with our preparation for our end of year recitals. We are assessed through chamber (opera/showcases) and an end of year recital at the end of year which are usually set in late October-November. This is where we showcase what repertoire we have learnt throughout the year and for 3rd year students upwards, our recitals are public so anyone are welcome and this is usually our most important exam before graduating. Did you always know that singing would be a career pathway for you to pursue? Well, the funny thing is I started playing piano at the age of 5 and I forced my parents to take me piano lessons and I’ve always loved listening to artists like ABBA, Celine Dion, Michael Jackson, Elton John, Whitney Houston – and I never knew I’d actually pursue singing more than piano – It was quite by accident to be honest haha! By the age of 10, I started playing at church congregations which I loved because I remember how I would enjoyed staying up to practice piano to my goldfish until it was midnight and I’d be forced to sleep for school the next day haha! The advantage of playing at church made me learn chords and sight read quicker than I needed to from the level I was at during my piano lessons, and as I grew older and started classical singing training. I was able to learn a lot of music at the same time because I loved playing the music myself and exploring new music and writing a whole list of where I could sing this song and that song. I was a very optimistic child growing up and I loved to practice. I was quite lucky to have that attitude towards everything I did – particularly because of my parents and their great examples. What a great lead into singing though. That’s great to hear. Take us back to when you were 15 years of age when you performed for the NZ Prime Minister at the time, Helen Clark. How was that experience for you? My experience as a young singer performing for the Prime Minister was quite nerve wracking to be honest. I didn’t know what to expect and because I just started classical training at the age of 14, I was very nervous also because I was sick with the flu that time. As it was my time to perform, I took a deep breath, looked at the audience and just admired how many people were there to see me sing. It was a great feeling – but I was a little perfectionist so when I knew I made some mistakes in my song, I would go to the toilets and start crying to myself, then I’d go home and practice harder. I got to meet the prime minister and she complimented me and encouraged me to keep singing and working hard. I am honored to have had that opportunity and just from the words of encouragement and positive feedback from that audience, I went home with that feeling where I knew where my second home was and what I wanted to do and that was to take opera singing to another level and get further training and hopefully make a mark in the world for myself and my family. With the support that you’re receiving from loved ones, I believe that you will continue to excel. What do you love about opera? What I love about opera is the fact that we can play different characters and be set at different scenes – having a taste of what it would have been like to live in that era of when a particular opera was written and just being able to interpret your roles your own way and bring something new and fresh to the stage. Another thing I truly admire about operas is how it has a mix of drama, love and tragedy all in one – well most haha. This makes it much more enjoyable to act out and sing. The arias that are in these operas are always what an audience would look forward to hearing. It is very challenging to sing an aria technically combined with expressing what it is about in your face and your body language, but when one has all of that in a performance – it is perfect! For those who don’t know what an aria is – an aria is “an accompanied elaborate melody sung by a single voice” and this is where a certain character is expressing how they feel about someone or something in a piece of music. Who are the opera singers that inspire you? The opera singers who have inspired me mostly are; Maria Callas – The way she captures an audience with her performance is amazing (I wish I could touch people’s hearts with ever performing as good as her one day), Joan Sutherland – Her legato line is something to die for (I definitely want to get my singing technique to a level at which it becomes second nature and I don’t have to think so much when performing even though I know I always will) Dame Malvina Major – The control she has in her singing especially at her age now, she sings flawlessly and even though she has had an international career and is very well known, she is the most humble woman you could come across and I hope to have that kind of attitude. Now she’s my singing teacher and I feel honored that she wanted to teach me and help me fix the many flaws I have from old habits of singing. What are the highlights that you have experienced thus far with opera singing? My highlights with opera singing have been the master classes that I have been privileged to be a part of and being able to meet these professionals face to face such as; Dame Kiri Te Kanawa’s masterclass which was held in Napier – I was chosen as 1 out of 6 to participate in this master class which was run by the New Zealand Singing School last June. I’ve participated in master classes with David Harper, Keith Lewis, Frances Wilson, Dame Malvina, Semyon Rozin and Juliana Gondek. The skills that I’ve been taught from each one of them I will always cherish – these are words of Gold and all you could do back is to work very hard and apply all these to your singing and hopefully by time you one day nail it. Have you had any lowlights during your pursuit in singing? Yes I have. My study in this hasn’t been the smoothest of rides like my fellow colleagues. I have hit rock bottom and I have picked myself up again and has never looked back. I started my study when I was 17 at the University of Auckland. My first class was very scary and after two years of majoring in that I decided I wasn’t mentally ready to take on this as I was still quite new to it all. I thought I had so much work to do and I just needed to wait for my voice to develop more in order to feel like I was ready to continue. I continued with my other major and then thought it really wasn’t for me. I then, took about two years break from studies and travelled to El Paso, Texas. On the flight there, the movie “Eat pray love” was playing and I got inspired from that. The movie was about finding yourself and that was exactly what I needed to do. I spent my 21st celebrating in Texas and also working as a data entry clerk at Wiggs Middle School where my aunty and uncle both worked as well. I enjoyed my time there, and when I came back to New Zealand I had a whole new perspective of seeing things. I went back to Auckland Uni and re-auditioned and got in to finish my 3rd year but then my history was not going too well. I left Auckland Uni after first semester, an amazing woman helped to shape me into an audition for Waikato University to do my 3rd year studies there and so after a few months of hard training with her, I went in and auditioned and got in. Two years later, I am doing my honours and I feel so thankful for my heavenly father and for my parents and loved one for helping me through these rough bumps. I think when trials like these hit you in life – it is about how you overcome them and always believing in yourself and never giving up on your dreams. Absolutely! I agree and on that note, a huge congratulations to you on landing your first major lead role as Mahina in the opera The White Lady by David Griffiths at the University of Waikato in August 2014. Tell us a little more about it. Thank you. Yes it was my first major lead role. So, the White Lady opera is composed by David Griffiths and the libretto is by Lynn John which tells the story of two start struck students amidst the turmoil and intrigue of downtown Auckland, centered round the iconic White Lady takeaway caravan. The vocal students of the Conservatorium of Music from the University helped bring this whole production to life and the audience loved it. 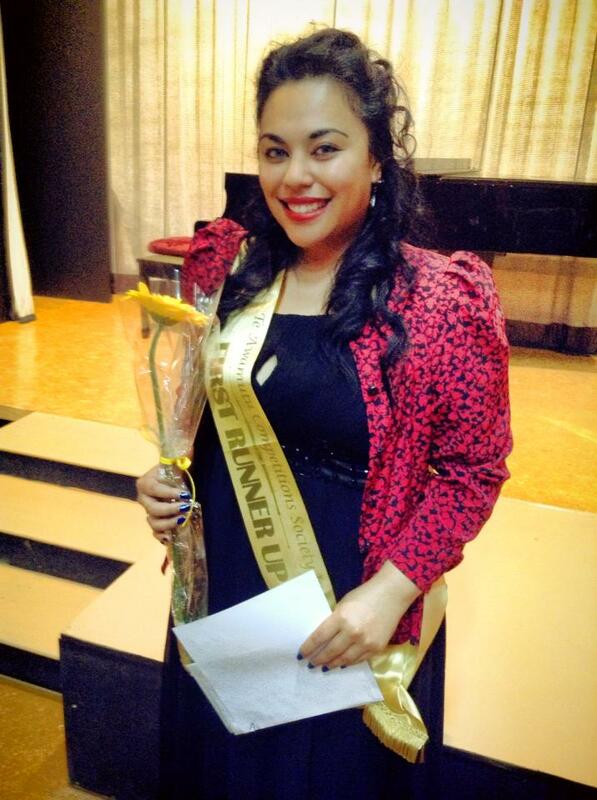 Another huge congratulations to you on becoming the recipient of the Wallace Corporation University of Waikato Blues Award for Excellence in Vocal Performance on Friday 3rd October 2014 and for also finding out last week that you are 1 of 80 students selected to attend the New Zealand Singing Sschool in Napier. How do you feel about all of this? I just feel that everything has elevated quite quickly. As mentioned earlier, I have hit rock bottom and so working hard towards my goals was the only option that I felt that I really had. 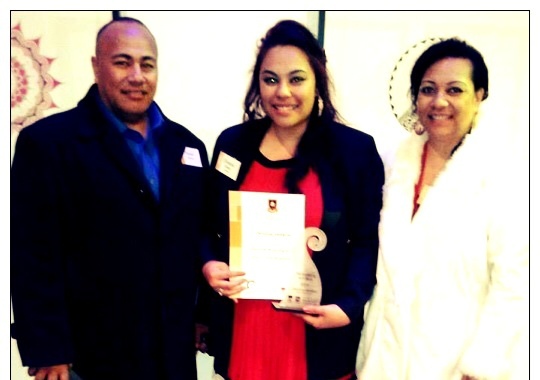 So I am thrilled on not only receiving the award but also for being accepted into the New Zealand Singing School. I feel blessed because I never expected 2014 to turn out like this. I will continue to work hard next year and I will continue to place my trust in God to do the rest. I am so happy for you. What is on the horizon for you? At the end of this month, I will be performing at Dame Malvina Major’s benefit concert (see flyer at the end of this post). And next month, I will have my final recital at The University of Waikato. For next year, I will be studying my Masters in Voice performance with Dame Malvina and will also work on the side to help assist myself with flatting in Hamilton and being away from home. I am very excited for what next year has to offer me so I just have to keep working hard and doing my best. Exciting times ahead for you indeed. What would your advice be for the younger generation who are interested in pursuing a path in opera singing? I think for the younger generation who are interested in pursuing this path – please make sure that you choose wisely your teachers and those who are there to help you along. Always believe in yourself and work very hard. Never let anyone tell you cannot achieve anything. If you put your mind to it – you will succeed. I don’t promise that it will be the sweetest and easiest path to take but it will be the most interesting. So, take it and enjoy it. Never give up! 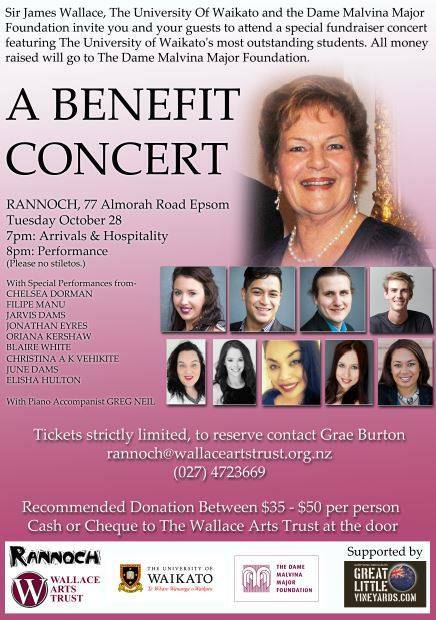 If you are available to attend Dame Malvina Major Foundation’s benefit concert in Auckland on 28th October 2014, where Christina Vehikite will be performing live, please refer to the flyer attached below for details. If you are available to attend Christina Vehikite’s final recital in Hamilton on 6th November 2014 at the University of Waikato here are the details for the location: University of Waikato, Gallagher Academy, Concert Chamber, Knighton Rd (Uni Gate 2b), Hillcrest, Hamilton 3216. What an amazing young woman you are Christina! 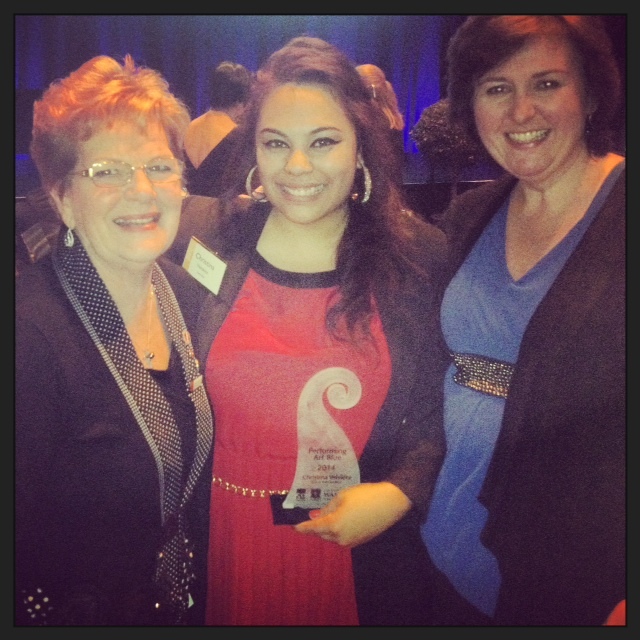 Thank you Creative Talanoa for this blogpost, this is an inspiring story and journey to share. All the best Christina! Thank you Rita for visiting Creative Talanoa. Wishing you a wonderful Christmas and a Happy New Year. I enjoy reading about the culture and successes you journal. My wife and I hope to visit next year. Thank you for visiting Creative Talanoa. I appreciate your feedback. Hopefully you and your wife will visit NZ in the new year. I am sure that you will both enjoy it here. Wishing you a Merry Christmas and a Happy New Year.